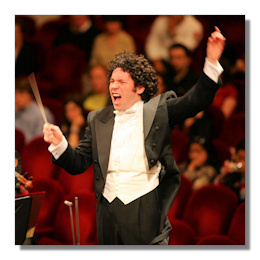 Touring Europe, the Simón Bolívar Symphony Orchestra of Venezuela (SBSO) under their Music Director Gustavo Dudamel performed two concerts in Brussels. Dudamel already guested in 2009 with the Gothenburg Symphony, but for the orchestra it was a long overdue debut in the Belgian capital. The arrival of El Sistema's crown jewel and its brightest gem had been well prepared in the media and not surprisingly on both nights the Centre for Fine Arts was filled to capacity. Perhaps not so much the new audience that is often mentioned in connection with "the Dude", but people of all ages who still made it quite clear for what reason they attended the concerts. That recently the praised Venezuelan educational system received a fair amount of flak, or that the country itself is going through rough times, wasn't going to spoil the fun. Dudamel and the Bolivars were in town. Hearing (and seeing) the SBSO live for the first time is of course an experience. The commitment and the energy of these young artists is something to behold; their joy at making music exemplary (we could use some of that here), and there is no doubt these are admirably skilled musicians. The orchestra is a tight ensemble, a real team – remarkably, predominantly male. All sections make a good impression; their responsiveness and alacrity are quite extraordinary. What they don't have, though, is an attractive sound, or much variation in it. No matter how well drilled, there wasn't a section (the cellos perhaps excepted) which produced a sonority memorable enough to challenge as yet the top orchestras – say the Royal Concertgebouw, the Chicago Symphony or the Vienna Philharmonic. Refinement of timbre or the search for a specific color doesn't seem to rank very high on their agenda. Their way to play loud, that is very loud (a characteristic which isn't solely related to the fact that they are numerous), quickly becomes wary in the classic European repertory they programmed. It's undeniably music making of great brilliance and directness, but also of a definite artificiality and exhibitionism rather than profound musical insights. Mindful of the recent terrorist attacks in Paris, maestro Dudamel addressed the audience the first night, reminding us that Beethoven's music is a symbol of humanity and dedicated the performance to peace, tolerance and unity. For all that his reading of Beethoven's Fifth sounded very belligerent in spirit with its outsized attacks, heavily accentuated chords and tendency to sacrifice clarity to loudness in tutti. It had me thinking of old Goethe who feared the roof would come down when Mendelssohn played him the symphony – in fact, a harbinger of what was to come for the remainder of these concerts. The SBSO assembled a huge ensemble for Beethoven, with a mass of strings anchored on 6 double basses, but also quadrupled woodwinds and three trombones. And still from my seat quite close the podium strings and brass sounded like a wall of sound which drowned the winds and diminished the characteristic exchanges between orchestral sections. As a performance Dudamel's Beethoven was very uneven. Over the top in the outer movements, with some bizarre quirks thrown in (the oboe passage in the Allegro con brio doesn't have to sound like a concerto), dramatically bland in the middle ones, the idea of C minor turning into a victorious C major was hammered home in almost Wagnerian manner. So much for humanity. Worse came with Wagner's Ring fragments. Granted, these operatic chunks are quite hard to pull off in a concert venue, yet maestros like Otto Klemperer and George Szell have proven they can have a life of their own. For Dudamel however they seem primarily orchestral showpieces without any attempt to follow the narrative. His suite began with the Entrance of the Gods into Walhalla, followed by Siegfried's Rhine Journey, Siegfried's Death and Funeral Music from Gotterdämmerung. Then it was back again to Siegfried with the Forest murmurs, to finish the concert with the Ride of the Valkyries from Die Walküre. This lack of dramatic cohesion might still have worked if the interpretation was in any way revelatory. It wasn't. Dudamel zeroed in on a few brilliant moments, obtained some earsplitting tutti, but in between he seemed as much at a loss as in his Richard Strauss recording with the Berlin Philharmonic. The massed forces of the SBSO, fielding 12 double basses and a brass section that covered the whole width of the plateau, produced volleys of sound you could pick holes in, but unfortunately also turned the Rhine into a murky river. It took Siegfried an eternity to arrive and his funeral procession was strangely uninvolving, in spite of the excellent brass. And yes this ringing cellphone at the quietest moment of the procession was unforgivable, all the more so because it came from an orchestra member. The Forest murmurs came off best of all, with some excellent woodwind solos but for the most part this was very dull Wagner indeed. No matter, after the final chord of The Ride of the Valkyries there was a standing ovation. Dudamel gratified with Isoldes Liebestod which radiated an ardor unheard until now, but also magnified his unconvincing way to handle an orchestral buildup. The second evening opened with Julián Orbón's Tres versiones sinfónicas. A completely unknown composer on these shores, Spanish-born Orbón (1925-1991) lived in Cuba, Mexico and the US, and had studied for a year with Aaron Copland. His Tres versiones sinfónicas is a colorful cocktail based on Spanish, medieval vocal, and African music, that was premiered and awarded in Caracas in 1954. The Bolivar's in full force performed it with tremendous vigor and zest, with joyous strings, biting brass and spiky percussion. Here too, however, there were problems of orchestral balance and volume. The music of Gustav Mahler has been a recurrent feature and of great significance in Dudamel's career. After hearing this Fifth though I'm not convinced he really nails his Mahler. Dudamel conducted the symphony from memory (as indeed he did the whole concert), paying attention to an amazing amount of orchestral details and tempo shifts to the point of over-analyzing. The orchestra played like possessed, solos were superb, and there was a dazzling array of ideas, too many in fact to convey the main message. Coupled to the colossal scale of Dudamel's approach, the outsized dynamics (we had to wait for this symphony to hear the first true pianissimi of these concerts) and sonic excesses, the music acquired far too often a purely demonstrative quality, in effect – to use a cliché – closer to Hollywood than fin-de-siècle Vienna. It's forcing the music instead of letting it speak for itself. This worked to a certain extent – the first movement was well handled, as was the opening of Stürmisch bewegt, yet a more subtle conductor would have kept the real climax for the end of that movement instead of turning each outburst in a loudness contest. The Scherzo however emphasized a crucial flaw in Dudamel's direction: as if he was breaking up the movement's sections in order to create tension in each bar. The result was emotional overkill, loss of density (not to mention loss of orchestral precision), and these bizarre moments of stagnation. The Adagietto, too, suffered from his drawn out tempo and the lack of body in the first violins. The final movement was by contrast more convincing and it seemed as if the whole orchestra was taking part in the jubilation. More relaxation followed in response to the rapturous reception in the form of Leonard Bernstein's Mambo from West Side Story. To everyone's delight the Bolivar's pulled out some of the antics from the early days, including spinning cellos, a feisty percussion section, and the whole orchestra standing up to shout Mambo! All irresistible fun, if even now way too loud and flat. But by then nobody cared any more – well, almost nobody.